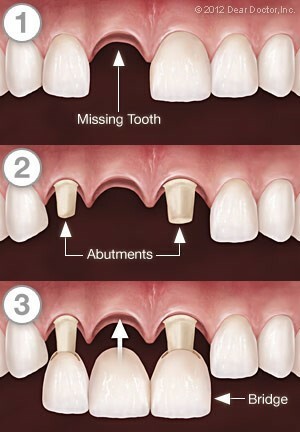 Bridges can be used to replace one or more missing teeth as well as to cover the gaps of the missing teeth. The bridge is cemented to the natural teeth or implants surrounding the empty space, which act as anchors for the bridge. Later, a crown is placed on these teeth along with a replacement tooth, known as PONTIC, which is attached to the crown to fill the gap. It is important to know just like crowns, one can choose the material for their bridge. 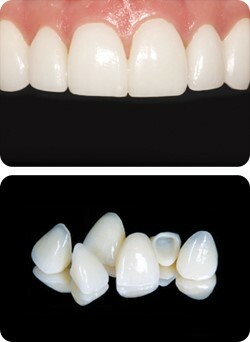 Porcelain or ceramic bridges are very popular and they can be matched to the color of your natural teeth. A crown is like a cap or cover for a tooth which helps to bring tooth back to its normal shape and size. Crowns are the best way to strengthen and improve the tooth and its appearance and we often recommend a crown if you have a tooth that is generally too damaged, not properly aligned and crooked. If you have cracked teeth, a crown will hold the tooth together to seal the cracks, best to prevent further damage from occurring. Not only this, but crowns can also be used to restore a tooth when there is too little of the tooth remaining to attach a bridge as well as it is best for cosmetic purposes to cover badly shaped or discolored teeth. For more precise fit, PFM is the best to go with. Its metal substructure attains more exacting fit over its tooth rather than all-ceramic options. They can easily be cemented when the tissue is unhealthy, however, it is known for its delivery process, which is less complicated. 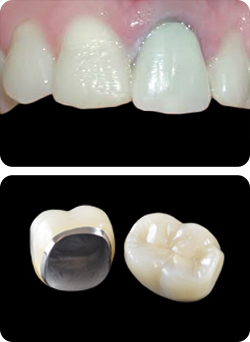 Zirconia crowns are very strong and can help in chewing and biting anything you want. It is durable and very resistible to high temperatures. 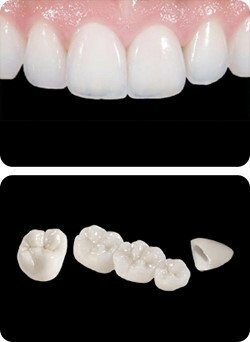 Talking about its appearance, it is hard to differentiate between Zirconia crown and the natural tooth. Also, such crowns can be modified as per the shape and size of the teeth. It is less prone to chipping than zirconium crowns. Get a crown that is tough and durable, but it looks exactly like your other teeth. The very same crowns are the best ones in terms with everything, so it is more than worth it to spend extra. Dental crowns have a range of cosmetic and restorative uses and they are the best to provide additional support to damaged teeth, or an ideal option to mask dental flaws such as misshapen teeth. We offer custom fabricate porcelain crowns to ensure that their dental crowns are appropriate in size, shape, and color and they glad to have such amazing results they were looking for. 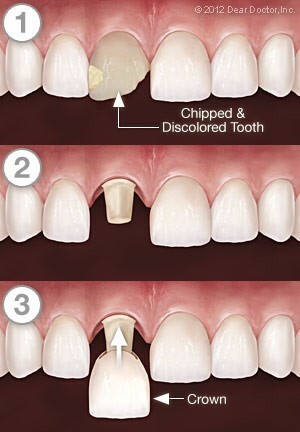 Once your dental crown is secured in place, it will discreetly blend in with surrounding teeth. We have successfully performed thousands of cosmetic dentistry procedures and always let us know our patients about the benefits, procedures, and preparation associated with the dental crowns procedure so you can be more informed about the complete information of the dental treatment. It typically takes two separate appointments to make and place a new dental crown. The first appointment involves: Preparing the tooth, taking its impression and placing a temporary crown. It will hardly take 30 minutes to an hour. During the time period, a dental laboratory will fabricate the crown. In the second visit, we will cement the finished crown into place. This step can usually be completed in about 20 minutes or so. 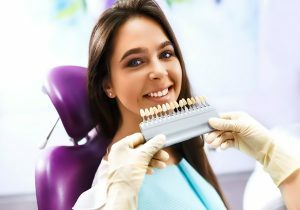 Crowns and bridgework require some sort of care as you do with your natural teeth. Be sure to brush and floss between all of your teeth — restored and natural twice a day to reduce the buildup of dental plaque. When you have crowns, it is even more important to book regular appointments of cleanings at the dental office. Avoid using your teeth as tools to open packages or chewing hard things. If you have a grinding habit, wearing a guard would be a good idea to protect your teeth as well as your investment. Centre Dental is proud to provide a warranty for all crown and bridge work by any of our dentists. However, the warranty coverage requires regular scheduled visits and compliance. Please ask us for details. Together, we’ll make sure your crowns and bridgework last a long time.